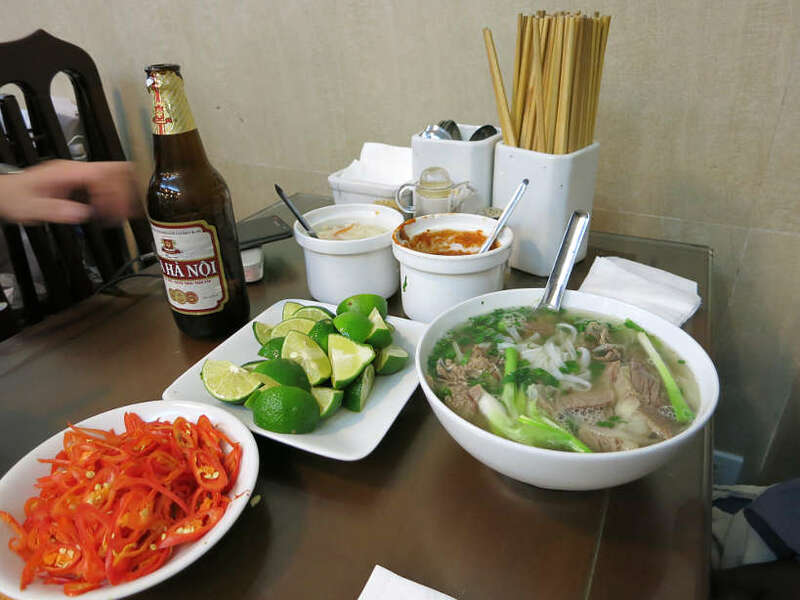 Pho is considered as the nation’s soul food of the Vietnamese people. Many poets, famous writers have written about this particular dish. However, this article is not about the traditional noodles that are still being praised, let us try different but still very delicious varieties of it, which are pho rolls and stir-fried pho. Firstly, when you schedule your flight to Hanoi, you can check the flight ticket at Justfly, after that you will probably discover the map of Pho in Hanoi: Pho Ly, Pho Thin, Pho Vui, Pho Sand, etc. However, this tradition type of pho is best eaten in the morning. In the evening or at night, or when the whole family wants to eat out, they often go out to eat famous noodle soup at 45B Bat Dan, or Hang Buom, which is also very close to traditional noodles. Other regions also have stir-fried pho, but many gourmets have identified that Hanoi’s one pho still has its own substance that cannot go anywhere. The process of making stir-fried pho is much simpler than which of traditional pho. The main ingredients consist of only 3 types of beef noodles, beef and vegetables, and less dough. Additional ingredients are for example green peas, green onions, carrots. The chef will fry the beef with high heat, after the garlic has been cooked to a corner. Next, use the same pan to stir-fry the noodles. Finally, vegetables are stir-fired in the same pan with the beef to make them soft and sweet. Once finished, the dish is served to the customers. It is only 5 to 7 minutes from when the order is made until the dish is served. New customers would not like it at first, they often complain about the fat, the over-tenderness and the smell of the smoke. Unlike ordinary noodles, sweet and delicious, for this stir-fried pho, the more often you eat it, the more you will like it. The smooth noodles are saturated with beef, or basket of bean sprouts, fried vegetables with delicious food. Pho is stir-fried until it absorbs the smell of smoke, however when you taste it, you will not feel the smoke, how magical! Raw vegetables are still crunchy. The recipe of stir-fried pho is a traditional secret, no matter how curious one can be, they cannot find out what it specifically is. Until then, let us continue to enjoy the deliciousness. In Hanoi, there are only a few places that have the authentic stir-fired pho. You can refer to the two addresses above or other restaurants such as North Gate noodle. It’s still just beef and rice noodle; however, this dish is especially separated from the fat (but of course, except fried beef). Suddenly, during a hot summer day, when one wants to eat something cool, they will think of instant noodle roll. This is a successful variation of regular noodle soup, especially from Hanoi. Best pho roll must be found in Ngu Xa, Tay Ho. Previously only a few small shops, but nowadays, once you enter, I guarantee that you will be dizzy by so many options for pho roll here. How to make pho rolls: first, cut the noodles into rectangular sheets, each sheet has the size of a palm. Next, fry the beef with garlic for aromatic, the beef must be stir-fried quickly with high heat to avoid chewiness. Finally, come to fresh salads, which are typical of northern Vietnam: salads, spices, basil, etc. The specialty of pho rolls is the process of rolling the pho. Spread the sheet out, topped with lettuce salad, followed by the remaining herbs, put on the top a few pieces of beef. When the winding to cut the hand, to stop the insides from falling out. The sauce must also have its own formula, three spoon of sour and a spoon of sweet, three spoon of salty and one spoon of sour, etc. depending on the chef, as long as he can bring out the sweetness and sourness and combine them perfectly. There are also places where people add some sliced, crunchy papaya. Dip a piece, take a bite, you will feel the entire freshness. The food is frugal, simple but very attractive. 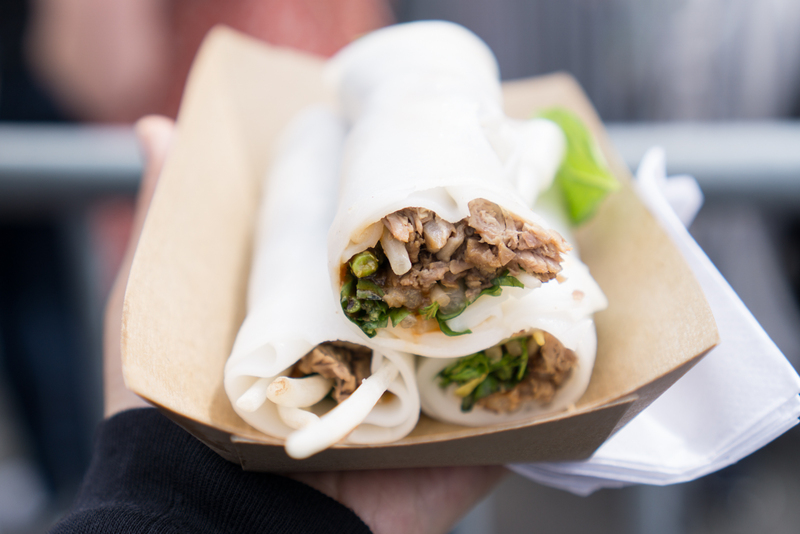 When to eat pho rolls: Pho rolls are not often served as a meal, but only a snack. You can eat this at any time of the day. The restaurant is located in the heart of Ngu Xa. This shop also serves some additional dishes such as fried noodles, mixed pho which taste quite extraordinary, you can try more. Any other type noodles that you want to introduce, please let us know. Besides the pho, the food world is also extremely rich with many beautiful scenes. It is now necessary to plan your own trip and book cheap flight to Hanoi. Step into the capital thousand years of civilization and discover the interesting things for yourself.